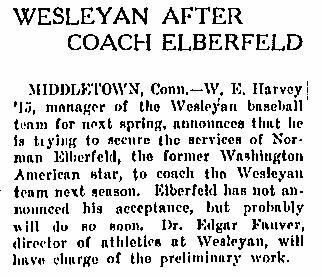 MIDDLETOWN, Conn. - W. E. Harwey '15, manager of the Wesleyan baseball team for next spring, announces that he is trying to secure the services of Norman Elberfeld, the former Washington American star, to coach the 'Wesleyan team not season. Elberfeld has not announced his acceptance, but probably will do so soon. Dr. Edgar Fauver, director of athletics at Wesleyan, will have charge of the preliminary work. Note: Kid Elberfeld never took this job.